Carlene was baptized on Saturday!! It was so exciting. She has met with missionaries on and off for 6 years and she finally made the decision to be baptized. I played such a small part in all of it, but it was so amazing to watch her make changes in her life and see the blessings that came from it. She really wanted to be baptized on December 31, she chose that date back when Sister Ram and I were still teaching her. I love the symbolism behind the date she chose! It is a day where you make new resolutions to improve yourself. The decision to be baptized and to be born again was a pretty good resolution in my opinion 🙂 The spirit was so strong! Also her whole family came to the baptism and her 16 year old daughter wants to take the discussions! I love the spirit at baptisms. And it was the perfect Christmas gift because in our mission we’re not allowed to go back to past areas for baptisms but President made a special exception for us, for which I am so grateful! 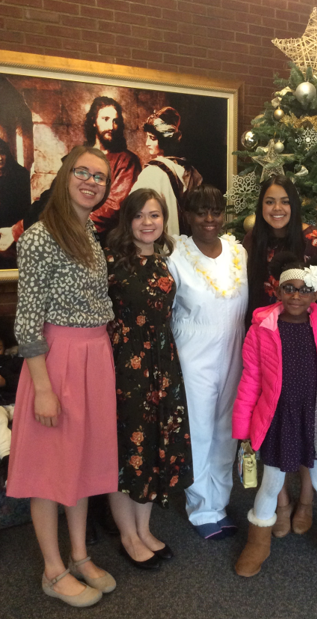 ← Sister R. Moore: Baptism!